Similarly to employment data, many investments are either undisclosed entirely or disclosed without financial figures. This makes it difficult to reach precise estimates of annual funding, as well as to accurately value companies and the ecosystem as a whole. 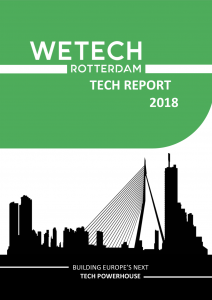 Yet, valuations for a (limited) number of companies from the above analysis point to a steep increase in the total cumulative valuation of Rotterdam tech companies. A closer look at the annual funding since 2013 indicates that 2016, 2017, and 2018 (to date) have vastly surpassed the trend of previous years. A closer look at the individual funding rounds points to the strong impact of a few, very large rounds. Of the €159 million raised in 2016, for instance, Coolblue’s series D accounts for 140 million by itself. The table below outlines the largest (disclosed) investment rounds in Rotterdam tech since 2016. In each year, the majority of total investment cam from just a few, albeit substantial, investments.